Oil prices and the TSX moved higher Monday after OPEC scrapped its planned meeting in April and said it will decide whether to extend output cuts in June. Oil prices and Toronto stocks moved higher Monday after OPEC scrapped its planned meeting in April and said it will decide whether to extend output cuts in June. The 1.2 million barrels per day cut made by the oil cartel in December has helped to dampen oversupply and U.S. sanctions against Venezuela and Iran will have an additional impact over the coming months. OPEC said it would slightly deepen the cuts in coming months. West Texas Intermediate, the benchmark North American contract, was up 50 cents at the close to $59.02 US a barrel, while Brent, the European contract, had soared to $67.46. Western Canada Select, the Canadian contract, stood at $46.36 US, reflecting the strength it has demonstrated since Alberta curtailed output. The TSX continued the climb it has maintained since the beginning of the year, up 11 points to 16,251 at the close. It was mainly buoyed by energy stocks. Energy stocks also rose in the U.S., and Dow was up 64 points to 25,914. However, energy's strength was counteracted by Boeing, which continued its fall, but financial and consumer stocks gained. U.S. investors are hoping their central bank gives some guidance over its rate hike plans later this week. The Fed is expected to hold rates firm and could indicate it plans only one rate hike this year. Politicians in London, meanwhile, continued to haggle about the United Kingdom's pending departure from the European Union, which could have harmful effects for global trade. The Bank of England will announce its decision on interest rates later this week as well. "In many ways, the market is in limbo," said Sam Stovall, chief investment strategist at CFRA. "And in the meantime, [investors] are waiting for some sort of agreement on the trade talks as well as the Fed." The outlook for oil is complicated by fears of a global slowdown, precipitated by the trade war between the U.S. and China. President Donald Trump has been critical of the Organization of Petroleum Exporting Countries, claiming it is forcing oil prices too high. 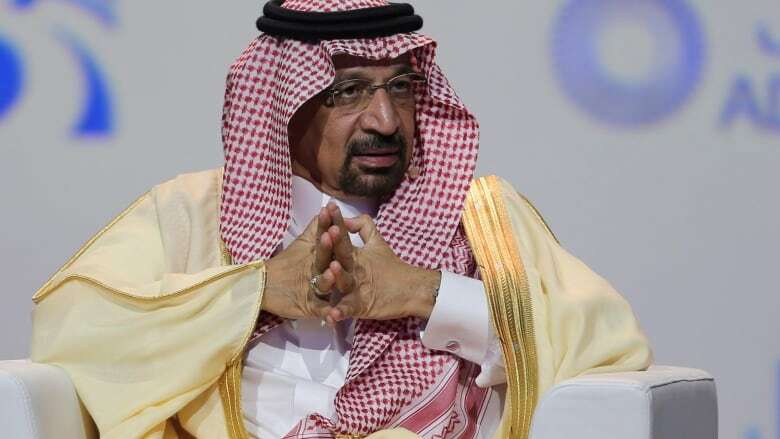 But Saudi Arabia's energy minister Khalid al-Falih said the market was looking oversupplied until the end of the year. He suggested the Saudis might be willing to extend the cuts in production another six months after a meeting in June. However, he said April would be too early for any decision on output policy. While OPEC is holding to its production cutbacks, the U.S. is increasing its shale production and exporting more oil.